c1961 Selmer Professional (TV12/T) Amp owned by Alan Myers. A Selmer catalogue circa 1961 advertises a much extended series of models from the previous catalogues, finished in a beautiful two-tone red and cream vinyl. Unfortunately, changes in fashion later resulted in many being found nowadays painted black by previous fashion-conscious owners. At this stage the prominent logo was still the Truvoice one; the Selmer logo not really becoming established until the next "Blue-Grey" period. Could easily be mistaken for a little radio, producing a mighty 4 watts (or 8 watts US, where they used peak output rating) via it's ECC83 (1), EL84 (1) and EZ80 (1) valves and tiny speaker. Size 15.1/2" x 5.1/2" x 9", front-mounted control panel with 2 knobs (volume, tone) and a pilot light. All for 11 guineas (a guinea being one pound and one shilling, it had stopped being legal tender decades earlier but it was still considered "posh" to quote prices in guineas). Slightly larger at 5 watts via EF86 (1), EZ80 (1) & EL84 (1) through 7" elliptical speaker. 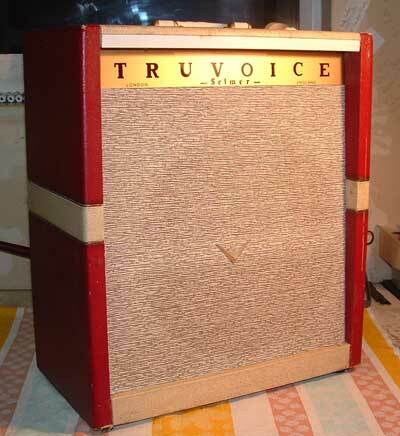 Size 13" x 11.3/4" x 5.1/2", side mounted control panel with volume and tone controls, pilot light on the top, 2 inputs on the chassis on the base of the amp, 14 gns. This version of the Standard seems to have been replaced by the upgraded New Standard + Tremolo (Model TV8T) during the red/cream era. Controls for volume, treble & bass/on/off. Valve complement said to be "one high-gain low-noise pentode, one high sensitivity output pentode and one full-wave rectifier" into a 10" elliptical speaker. Size 14.3/4" x 13.1/4" x 6.3/4". Price 16 gns. 5 watts also, but this one had tremolo. EF86 (1), ECC83 (1), EL84 (1) & EZ80 (1) into a 10" speaker. Size 14.3/4" x 13.1/4" x 6.1/4", control panel inset into the top of the amp with 2 inputs and 4 knobs (volume, tone, trem speed & depth) & pilot lamp. 21 gns, optional footswitch £2 7s 6d extra. This amp was also 5 watts output. Three main controls in recessed panel at top of amplifier - volume, treble tone, and combined bass tone with on/off switch. 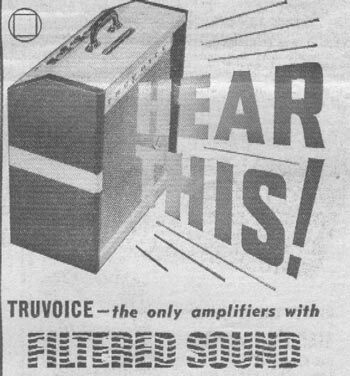 The Standard (TV8), without tremolo had been established a year or so earlier, hence the "New" suffix for the later one fitted with tremolo. The first model, prior to the TV12A, seems to have been The Universal (TV12). "For the boys in the big time" - a thumping 14 watts and tremolo, generated by EF86 (3), ECC82(1), ECC83 (1), EL84 (2) and EZ81 (1) and a 12" speaker (Goodmans Audiom 60 in most I've come across) to deafen the audience. Size 22" x 19" x 10.1/4", control panel mounted in a slanting rear-facing portion of the top having 3 inputs in a triangular format and an impressive array of 6 control knobs (vol Ch1, vol Ch 2 & 3, trem speed & depth, bass & treble) plus a very large pilot lamp. Footswitch included for 52 gns, serious money in the early 60's. This isn't in the 1961 catalogue, as it's the model superseded by the better-equipped Stadium circa 1960. It is near-identical to the Stadium but lacks the tremolo, hence only 3 controls (vol Ch 1, vol Ch 2 & 3, tone) and tube line-up of ECC83 (3), EL84 (2), and EZ81 (1). Slightly smaller all round than the Stadium at 20" x 18" x 9.1/2". The one illustrated has a Rola G12 speaker which seems identical to the Celestion G12's of that era, made on 27 May 1959 according to the date code on the rim gasket. Price unknown but probably around 35 gns. The Selector-Tone models were marketed on their wide tonal options, although history suggests that they couldn't compete with the top boost feature on the Vox AC30. The Rotary threw out 15 watts with tremelo via EF86 (2), ECC83 (2), EL84 (2) & EZ81 (1) and a Goodmans Audiom 70 heavy-duty 12" speaker. Size 19" x 21.1/2" x 10", with the control panel inset into the top of the amp and having 4 inputs and no less than 7 control knobs giving volume and tone on both channels, trem speed & depth, a pre-set range of switchable tone options and that large pilot light. Footswitch included for 65 gns. Into the big league - an ear-splitting 25 watts with tremolo via EF86 (2), ECC83 (2), EL34 (2) & GZ34 (1) and a 15" speaker. Speakers fitted seem to have initially been Jensen 15", maybe because British 15" were probably unobtainable in the late 1950's. However, later the Goodmans Audiom 80 was adopted. Size 23" x 20" x 10.3/4", control panel inset into the top of the amp with 4 inputs, 6 rotary controls giving vol/tone on each channel and trem speed/depth, and pre-set tone options on a row of 6 pushbuttons. Plus that big pilot light. Footswitch included at 75 gns. Like the above Rotary, most Selectortone Automatics were equipped with a large leather carrying handle, very similar to those fitted to old leather suitcases. However, some (earlier) units had a moulded rigid plastic handle. Click HERE to view the 1960 "Melody Maker" advertisement from which the above is extracted.